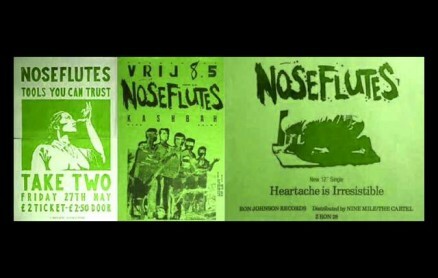 The Noseflutes were an unorthodox, late-eighties band based in Birmingham. They released three EPs and three albums, recorded four sessions for Radio 1’s John Peel, and received generally favourable reviews from the contemporary music press. Their second album, Zib Zob and His Kib Kob, rightly made The People newspaper’s list of The 101 Most Awful Album Titles of All Time. During their existence they became “the house band for Birmingham”. The band was formed in 1980 and both the band and the members went through several names before settling on the Noseflutes (previous names include The Blaggards, the Cream Dervishes, Extroverts in a Vacuum, The Viable Sloths, Pantaloni Brothers, and Shitstormer). The band’s first releases were on Reflex Records, home to The Very Things and And Also the Trees. Reflex issued the band’s first EP, Girth, in 1985, and the debut album Several Young Men Ignite Hardboard Stump the following year. They then moved on to Ron Johnson Records, who issued the band’s next two EPs, The Ravers (tracks from the band’s 1986 Peel session) and Heartache is Irresistible. When Ron Johnson ceased to operate, the band continued with their own Rictus Recordings label, releasing the albums Zib Zob and his Kib Kob and Mellow Throated in 1989 and 1991 respectively, before splitting up. The band were described by the Birmingham Mail as a “wonderfully perverse avant weird outfit”. Singer Martin Longley and bassist Chris Horton formed a new band, The Clicking Stick, along with Paul McKenna, releasing the album Mocrophone in 2001. Dave Pritchard and John Horton released two albums under the names Acme Spring Company and Cubans Dials in the early 1990s. Chris Long recorded under his stage name of Legs Akimbo, with Nick Duffy of The Lilac Time. In late 2010 many of the original members of the Noseflutes were performing as The Crimplene Explosion. Chris Long (no relation) AKA Legs Akimbo died several years ago: a lovely bloke who often squeeze my earlobes when we worked together at Virgin music. Turned me onto a lot of great music.